8/6 Cup of Coffee: As the minor league season continues into the home stretch, Pawtucket and Salem both used power bats and solid pitching as they continue their playoff pushes. The DSL Red Sox once again got outstanding pitching on Monday, as a pair of hurlers combined for a shutout. The offense never got going for the GCL Red Sox or for Greenville, who was shut out for the 14th time this year. 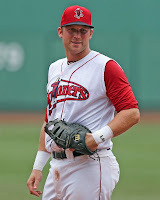 Pawtucket came from behind to take a 5-4 victory over the Buffalo Bisons (TOR). Down 4-3 in the eighth inning, Buffalo pitching retired the first two before Alex Hassan ripped a single to right. That brought the scorching-hot Dan Butler to the plate, and he delivered once again, knocking his 12th home run of the year over the left-center field fence. Butler, fresh off winning the July SoxProspects.com Player of the Month, has 10 home runs in the past month. The catcher also doubled and scored in the second, giving him a 2-for-3 night. Will Middlebrooks also homered, taking former Yankee right-hander and Red Sox nemesis Chien-Ming Wang deep in the fifth. It was a solid, but inefficient start for Allen Webster, who allowed just three runs on six hits, but needed 89 pitches to get through five innings. Webster struck out four and walked one. Alex Wilson continues to rehab, as he threw 1 1/3 innings, allowing a solo home run that gave the Bisons a 4-3 lead at the time. Ryan Rowland-Smith was credited with his first win since his return from an appendectomy, and Pedro Beato pitched 1 2/3 scoreless innings to earn the save. It was a similar story for Salem, who made good use of the long ball in a 5-2 win over the Wilmington Blue Rocks (KC). David Chester (pictured) led the charge, delivering solo shots in the third and fifth innings. They were the first two homers that Chester has hit since his July 24 promotion from Greenville. Stefan Welch also homered, a fourth-inning solo shot. Henry Ramos tripled and drove in a pair as part of a 2-for-4 night, and Blake Swihart also notched a pair of hits for the Sox. Mickey Pena continued his string of strong outings, allowing just one run on seven hits in seven innings, while striking out four and walking three. It was the fifth consecutive quality start for Pena. During that stretch, he has allowed just eight runs in 33 innings, lowering his ERA from 6.69 to 4.50. Nathan Striz tossed a scoreless ninth to notch his seventh save. Greenville squandered its opportunities in a 3-0 loss to the Kannapolis Intimidators (CWS), going 0 for 6 with runners in scoring position. Kendrick Perkins doubled as part of his second straight 2-for-4 performance, and Jose Vinicio delivered his fourth triple of the year, but both were left stranded. Jacob Dahlstrand took the loss, giving up three runs on 10 hits in six innings, and Austin Maddox and Manny Rivera combined for three innings of shutout relief. The Drive were hurt by one of their ex-teammates. JB Wendelken, who was part of the trade that brought Jake Peavy to Boston, struck out seven in three shutout innings to earn his first save in an Intimidators uniform. The GCL Red Sox mustered only five hits against GCL Orioles pitching in a 4-1 loss. Raymel Flores was responsible for two of those hits, including one double. He also had the Red Sox' only walk. Jake Drehoff got the start and took the loss. The 12th-round pick out of Southern Mississippi was making his second professional appearance, and he allowed a run on three hits in two innings. Edwar Garcia followed, giving up a pair of runs on two hits in four frames, while striking out a season-high six batters. It was another outstanding pitching performance from the DSL Red Sox in a 6-0 shutout win over the DSL Dodgers. This time it was Carlos Garcia and Algenis Martinez combining for the four-hit gem. Garcia got the start and earned his third win of the year. He allowed just two hits in his five innings of work, striking out five and walking four. Martinez followed and didn't miss a beat, allowing two hits in his four innings of shutout work, while also getting credit for his first career save. Darwin Pena had a big game to lead the Sox offense. The first baseman went 2 for 3 with a double, a triple, and a walk. Pena scored a pair of runs and drove in another two, taking the team lead on the season in RBI with 27. Raiwinson Lamenda also had a two-hit day and is riding a six-game hitting streak. Player of the Day: It was a huge night at the plate for David Chester. Leading the Greenville Drive in home runs when he was promoted on July 24, Chester had not gone deep in his first seven games with Salem. The 6-foot-7 first baseman broke out on Monday, hitting a pair of solo shots. Across two levels, Chester now ranks second among Sox minor league players with 15 home runs and 74 runs batted in.